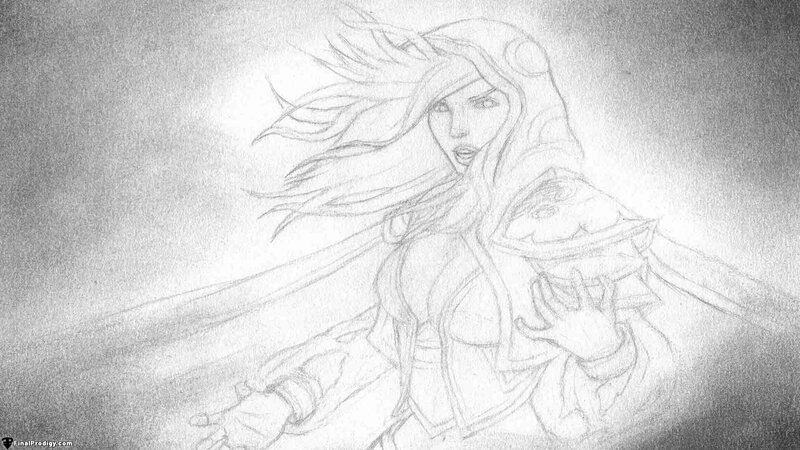 Draw a rough, simple sketch of Jaina's body. 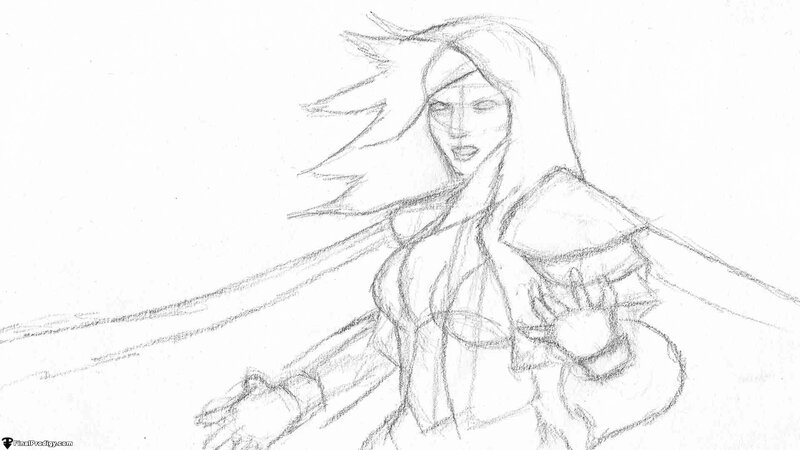 Start with basic shapes and a simple skeleton then sketch in the main features of her body and clothing. HB woodless graphite can expedite the sketching process. Use an eraser to erase unneeded lines and a 3H pencil to draw a more refined sketch over the rough sketch. 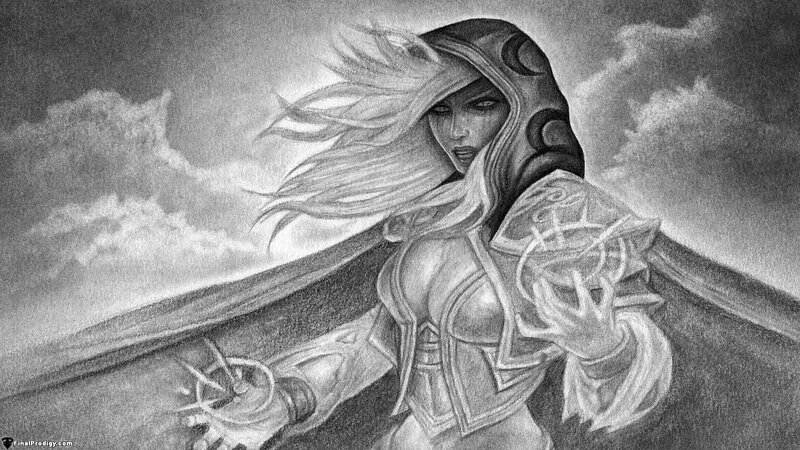 Roughly shade over the drawing with HB graphite then blend in the shading with a paper towel or blending stump. Use woodless graphite/powdered graphite to speed up the process. 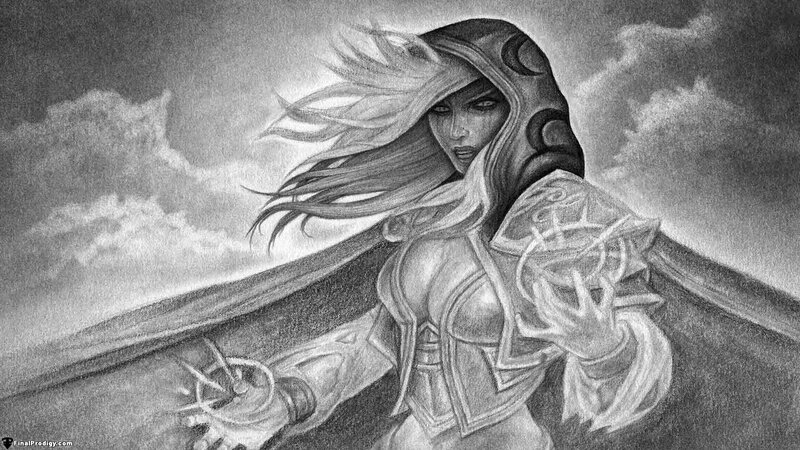 Use a B pencil to add a basic layer of shading to the drawing. Use a blending stump to lightly blend in the shading as needed. Use a 3H pencil to lightly build up on the shading of the previous step. Concentrate on drawing in every detail that will appear in the finished drawing during this step. Start adding final details by adding some definition to the background. Use an eraser/ blending stump to smooth out the background shading and create some basic clouds/smoke. 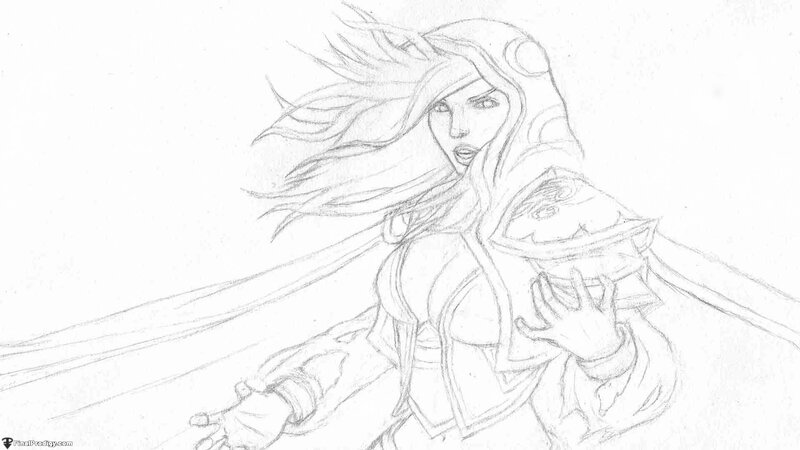 Start adding final details to Jaina by starting with her face. Use HB and B pencils for dark shading and a 3H pencil for details. 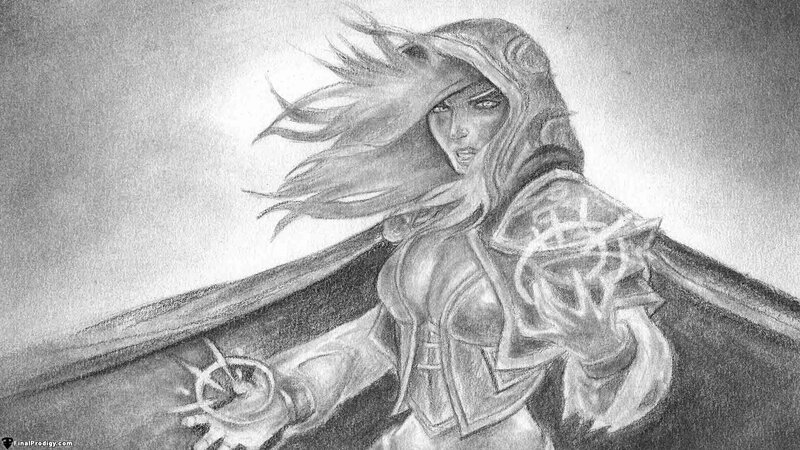 Define Jaina's hood. Be sure to pay extra attention to the outline of the hood. Use a blending stump as needed. Use a 3H pencil to begin detailing her hair. Try to make the strands follow the natural flow of her hair. Use a blending stump to aid with smoothing out the lines. Use an HB pencil in tandem with the 3H to add any darker shading. Define the rest of the hair before moving on to her torso. Use B and HB graphite to shade in her clothing and skin before using a 3H pencil and blending stump to smooth out and detail the shading. Define the left side of the drawing. 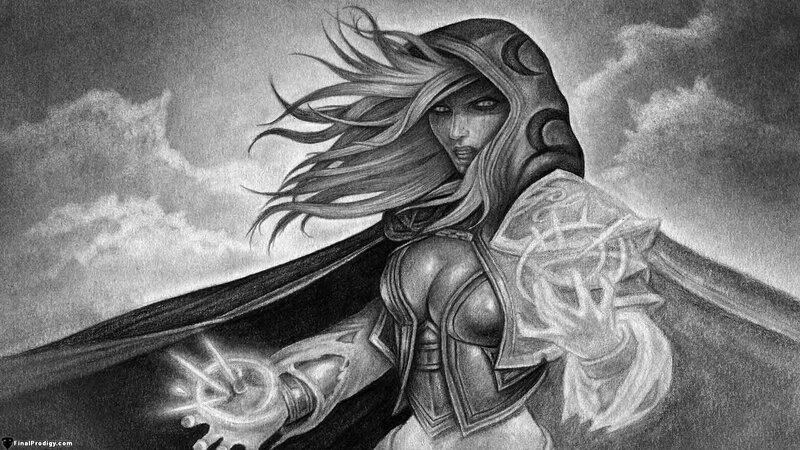 Build up multiple layers with an HB pencil to shade the cloak. Use a B pencil to make the shading darker. 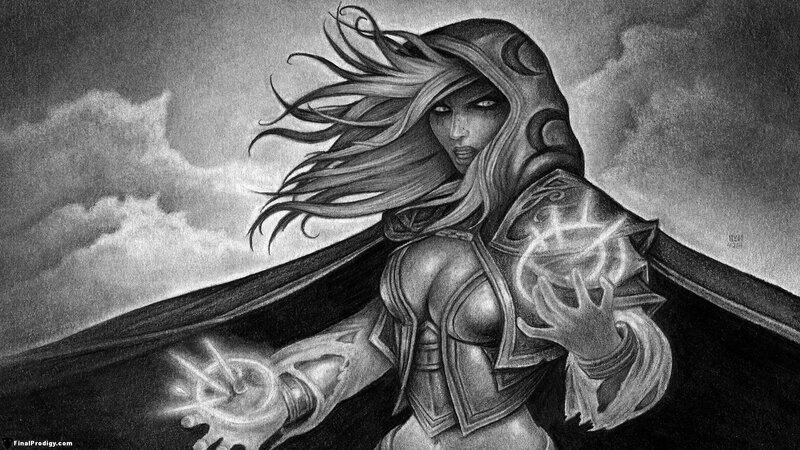 Use a 3H pencil and eraser to define the glowing arcane symbol and an HB pencil and blending stump to add the rest of the shading. 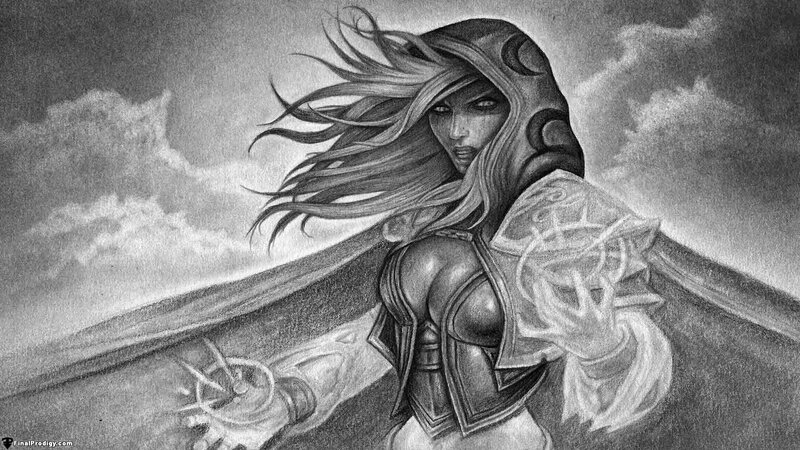 Build up the shading on the right side of the drawing following the same process used for the left side. Add finishing touches to the rest of the drawing by redefining outlines and cleaning up any rough shading.